Piano Restorations are the UK leaders in restoring and rebuilding pianos back to a condition that is better than when they where new. 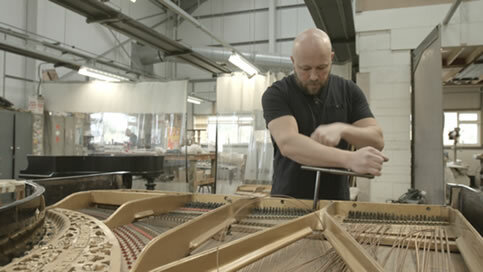 We have the largest piano facility in the UK boosting over 5000sqft containing the best equipment, tools and machinery allowing us to produce quality not quantity. Our small team of dedicated craftsman have had the highest level of training and are all nurtured by Colin Leverett who has over 65 years’ experience in the piano trade. When rebuilding a piano we know the significance it has and the sentimental value it may hold. With this in mind every piano that passes through our workshop is personal not only to the owner but to us as well. 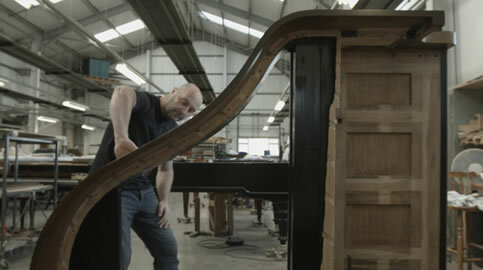 We have a huge sense of pride in our work and all pianos are treated as if they are our own. 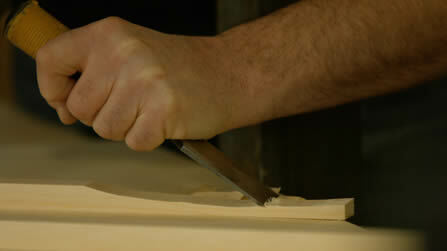 They all have a personal touch on our craftsman who dedicate hours of work to maintain such high standards. When rebuilding a piano, Steinway, Bluthner, Bechstein or Bosendorfer, we guarantee that we only use genuine manufacture parts. 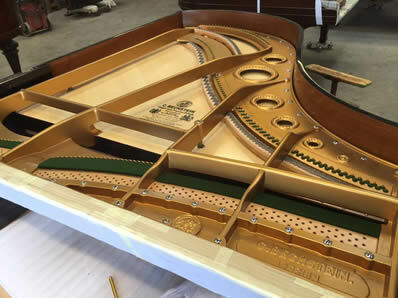 Throughout your piano rebuild we will keep you regularly updated on the progress and at any time you are more than welcome to visit and see its progression. Various case finishes are available, whether your piano is black or veneered finished we can transform this back to new. Pianos with wood veneer that has faded over the decades can be returned to their former glory. All old polish is removed and any veneer that has lifted can be re- secured and or replaced before the entire piano is hand sanded. Next the case is stained and layers of fresh new polish are applied, while expert colouring brings the uniformity of the whole case together. Many older black instruments have a crazed cracking appearance under the polish, this can be from the under veneer that was pickled during manufacture, this process was used to help the veneers darken. Stripping the ebony polish, sealing the veneer and finishing with a high gloss polyester finish gives the instrument that brand new look. If you have broken parts such as legs, desk runners, even tops, this is not a problem! Our team of artisans can replace any part like for like and in most cases with our modern machinery and techniques with far superior finish and strength. After de-stringing and numerous amount of measurements being taken, the cast iron frame is slowly removed from the piano. The frame in it’s original condition with our measurements is needed until we have fitted the new soundboard and wrest plank, from here the frame can be completely sanded back to the metal. New gilding in accordance with the maker’s traditional finish using the same traditional methods when it was first built. We have a selection of gilds we make up for each manufacturers style, whether this be a Steinway gold or Bosendorfer bronze, to the magnificent warm glowing Bluthner gold, we only use the original manufactures official colours. If your frame has cracked it will undergo a cold stitch weld repair, this repair is covered by our five-year guarantee. We highly recommend never letting anyone but an expert carry this out, we work closely with the most experienced company of cold stitching in Europe, so to ensure our work is of the highest quality. Once the stitch has been completed the repair is covered and sprayed over, you can get slight movement along the crack line but this is nothing to worry about, the nature of the repair is such of ‘KEY WAY’ so the more stress that is put on the crack the stronger the repair becomes. We endeavor to speed this process up in the factory environment and repair any movement. The soundboard is the most fundamental and vital element of the piano. Over the year’s tons of down pressure through the soundboard and central heating causes cracks to develop, this interrupts the flow of sound waves across the wood but more importantly these soundboards can become Concave rather than the Convex. The Sitka Spruce that is used to make soundboards actually has a life span. Sitka Spruce is made up of cellulose and lignin fibers, and over time the fibers break down causing the board to become dull, non-resonant and the only option is to replace. Once the offending soundboard does lose its crown it will never truly hold its tune, each time your piano is then tuned the board will move that little bit more, eventually the decay of the string will be extremely short and the tonal quality nonexistent. If you had a classic car that needed to be rebuilt and you did everything but left the original seized engine in, it would be very much like this scenario. The soundboard is the heart and soul of your instrument and must be set up correctly. If your soundboard has turned inside, shimming the cracks will never bring back the resonant tonal qualities it once had. For optimum performance the soundboard must be crowned. Through years of experience working with the original piano makers, we have developed techniques to replace your soundboard the way it was originally fitted. Under the expert training of Colin Leverett, we can guarantee that our soundboards will give your piano another lifetime of use but most of all it will sing like when it was new! The bridges; which hold the strings and carry the vibration of the string onto the soundboard, often these are extremely well made and can be retained, but if the wood has deteriorated being the root of pin movement and cracking then we can re-cap your bridge. Our recapping is revolutionary and to our knowledge completely unique in the piano trade. The highest quality quarter sawn maple is used, which we do not recap with a very thin layer, which appears to be industry standard. These thin layers in our experience are not strong enough to withstand the torque that the pin is under. It is also industry standard to make a tracing of the old pin positions and copy across, the problem we have with that is that these can often be wrong, therefore you are just copying across a mistake. That is way we laser-line all bridge lines back in, so there is no margin for mistake, every pin position is then drilled in place using our piano drilling table, that ensures each pin angle is uniform. The resulting product truly is better than new! The wrest plank holds the tuning pins tight and provides the tuning stability. Original wrest planks were made up from approximately 4 thick layers of hard wood, unfortunately over time just like a soundboard these timbers dry out and crack causing the tuning pin to become loose. The modern wrest plank is made up of multiple layers of hard wood glued at opposing angles of grain to ensure maximum friction onto the tuning pin. This modern material is far denser and will withstand climate changes and modern central heating. Once the plank has been fabricated and fits perfectly to the underneath of the frame it must be drilled to the exact measurements that coincide with the pattern of the tuning pins. In most cases a keyboard can be rebuilt so it can be used for another lifetime of the piano, but there are times where just like the life of the soundboard and wrest plank the keys need to be replaced. Replacing the keys will give your piano that new feel, with modern techniques and measurements, we can optimise the balance so the touch is far superior than the original action. We have the option of stress-less timber that the keys are made of, key buttons with bushings that are impregnated with a product that will stop that sticking key situation caused by climate change, to new key coverings that are porous and absorbent like the once traditional ivory. So whether the keyboard is rebuilt or replaced you have the guarantee that your action will play exquisitely, a completely even touch and weight will make it feel fluid and responsive. The action is the mechanical section of the piano and contains hundreds of moving parts. These parts are made from the finest wood, to exacting dimensions. Various types of felts, screws, springs and leather interact to allow the pianist delicate control of both the volume and ‘colour’ of the sound created. 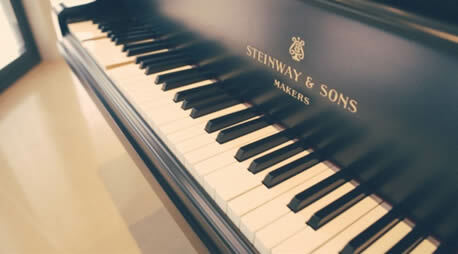 Action restoration varies from piano to piano, however generally we recommend two options. Firstly, to restore the existing action by replacing the hammers, felts, leather etc or secondly, installing completely new action parts. The latter is more expensive but gives the piano the feeling of a new instrument. This work takes hours of patient and detailed attention by highly skilled craftsmen. Once all of the parts have been restored or replaced, further hours are spent adjusting and finely regulating the action to obtain the maximum performance level. The new hammers will be ‘voiced’ to provide an even and beautiful sound across the range of the keyboard. 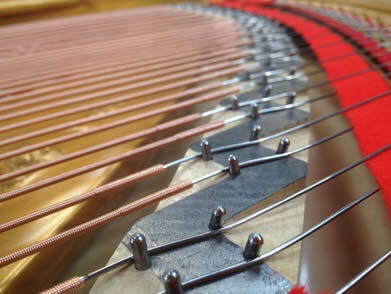 Voicing constantly changes as you play your piano owing to the compression of the felt hammer as it hits the string. Therefore, the voicing must be adjusted from time to time to even out the tone. Your technician will advise you but always trust your ear, if you are unhappy with the sound of a particular note or section of notes, have your technician voice them. Alternatively feel free to contact our Tuning and Servicing Department to arrange for one of our Specialist Technicians to attend.